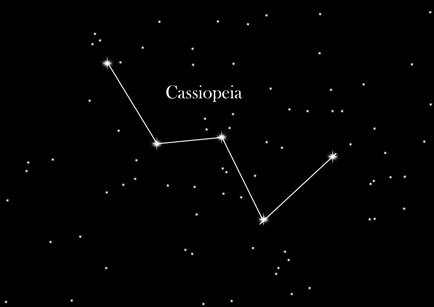 The Cassiopeia is a constellation of the northern sky. The Cassiopeia is visible throughout the year, although the best time to see it is in November. The Cassiopeia has produced two supernovas, one of those is known as the Cassiopeia A. The Cassiopeia A exploded about 300 years ago and the explosion has been witnessed from Earth. The matter emitted in the explosion was scattered into space at a few percent of the light speed. The material has since continued to expand into a giant shell containing a lot of elements including oxygen. These elements may form new planets, stars or even some living organisms in the future. The five main stars of this constellation form a "W" form. It shows the peak in the mid west in the direction of the north polar star - so you can easily find this constellation in the sky. The Ethiopian king Cepheus and his wife Cassiopeia had committed the sin of vanity. Cassiopeia had claimed to be more beautiful than even the Nereids, aquatic goddesses of Greek mythology. The Nereids complained to the sea god Poseidon about this insult, who sent out the sea monster Ketos, that devastated the shores of the country. According to an oracle the country could only be freed from the curse if Andromeda, the only child of the royal family, would be sacrificed to the sea monster. Mercilessly Andromeda was tied to a rock next to the sea, where she had to wait for the monster to come and eat her alive. Perseus defeated the monster, saved Andromeda and married her.